See copy of birth certificate! Draft card gave his birthday as 28 September 1887. He listed a wife and child in 1917; so this was probably Inez. Then in Nov. 1920, he remarried; so somewhere in between these events is when he and Inez must have divorced. 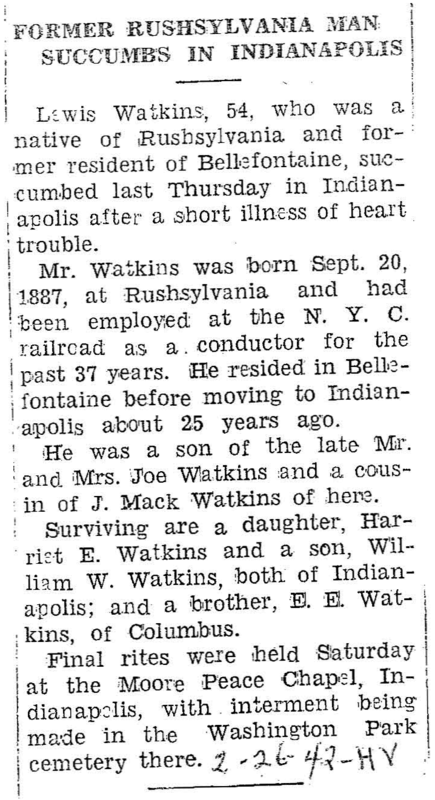 On the marriage certificate he called himself Lewis Edwin Watkins. First husband of Inez Wyburn and then husband of Ida Simmons. [S83] Birth Certificate, Bellefontaine, OH Probate Court Sept 22, 1938. [S414] 1900 United States Federal Census, Rushcreek Twn, Logan, OH ED 123 Sheet 8. [S131] Military Record, Registration Card 34-5-18-A. [S27] Watkins family genealogy, Page 13. [S117] Logan County Genealogical, Logan County Marriages 1873 - 1880 Volume E, Page 214 Transcribed by Debbie Bleger. [S416] 1880 United States Federal Census, Rushcreek Twn, Logan, OH ED 125 Pg 18. [S417] 1910 United States Federal Census, Rushcreek Twn, Logan, OH ED 145 Sheet 7B. [S415] 1920 United States Federal Census, Rushcreek Twn, Logan, OH ED 205 Sheet 5A. [S93] Marriage Certificate, Book J, Page 251. [S93] Marriage Certificate, Book J, Page 251, Probate Court, Logan County, OH. [S96] 1910 Miracode Census, ED 0130 Visit 0217. [S284] Indiana Marriage Collection, 1800 - 1941, Book 114 OS Page 303. [S86] ua, Indianapolis, Marion, IN ED 49-4 Sheet 1B Dwelling 15. [S449] 1940 United States Census, 1940 United States Census., Indianapolis, Marion, Indiana, United States ED 96-299, Page 3A, Dwelling 1018.